Opening on October 11th is Bibi, a selection of photography from Jacques Henri Lartigue at The Photographers Gallery, London. The body of work is having its first international showing after being unveiled early in 2013 at Les Rencontres d'Arles. The photographs, from the 1920s, depict Lartigue's marriage to Madeleine Messager, known as Bibi, who was his first wife and mother of his only son, Dany. She is shown here in variously intimate and more formal portraits, Bibi wistful at a restaurant table in the Cap d'Antibes (1920) or under a white celestial display of hotel cafe umbrella's in Nice. One key image, which no doubt will be the main press shot for the exhibition is a photograph of Bibi on a hotel toilet, naughty and dishevelled with her dark hair in a funny top knot. This is the night of her wedding, in December 1919, she looks happy, somehow shy, in love. Lartigue often photographed his family and daily life and a particular focus for the exhibition and obviously fitting for its location are images taken during his and Bibi's visit to London. Lartigues focus on his wife charts the relationship from fashionable bright young things to the upheaval that marred their later lives and their inevitable demise. Whilst at the start Bibi occupied the forefront of his images, in later shots she is in the background, or pictured lost amongst other women. 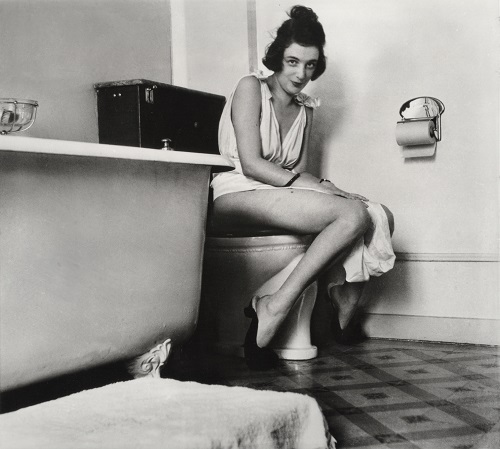 Lartigue's lens has moved away from her, his eyes is roaming and the couple divorces in 1931. Lartigue writes in his diary at the time "my broken heart only wishes her well"
Bibi will coincide with another Photographers Gallery exhibition, HOME TRUTHS: Photography, Motherhood and Identity. Looking at the work of eight contemporary artists; Janine Antoni, Elina Brotherus, Elinor Carucci, Ana Casas Broda, Fred Hüning, Leigh Ledare, Katie Murray and Hanna Putz. Together the exhibitions speak about different photographic strategies or accounts of human relationships - the bonds that are captured, often fleetingly, often intimately.